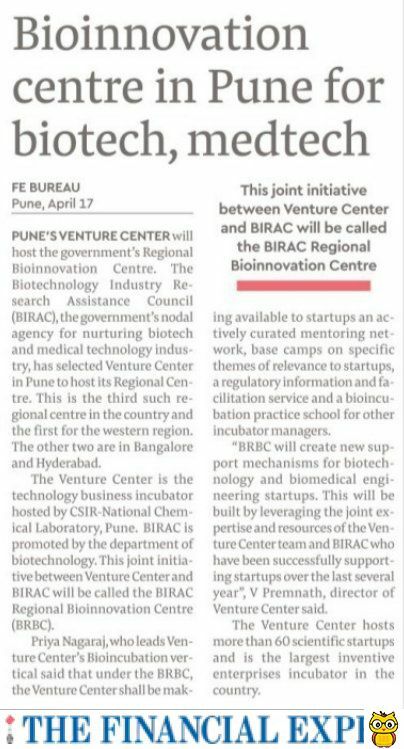 (1 Jul 2017) Call for proposal under "Biotechnology Ignition Grant (BIG)"
(26 Jul 2016)Notice inviting tender: "Refurbishment/renovation of space 900 NIP first floor of NCL Innovation Park "
(28 Dec 2015)Venture Center's 2016 Desktop Calendar released. Available online. (3 Aug 2015) Campaign: Anti-Microbial Resistance - "Building entrepreneurship in Anti-Microbial Resistance"
(3 Aug 2015) Campaign: Sanitation - "Building entrepreneurship relating to Sanitation"
(07 Jan 2015)Venture Center's 2015 Desktop Calendar released. Available online. (07 Jan 2014)TDB Seed Fund at Venture Center, Pune - Round 7 Now Open! (26 Dec 2013)NSTEDB Seed Fund at Venture Center, Pune - Round 3 Application date extended! (10 Oct 2013) Notice inviting tender- Bioincubator: "For Supply, Installation, Comissioning & Satisfactory demonstration of Advanced Confocal Laser Scanning Microscope System"
(3 Jul 2013)Notice inviting tender- BioIncubator: "Civil Renovation at 600 first floor of NCL Innovation Park for construction of bio sciences labs and office space"
(3 Jul 2013)Notice inviting tender- BioIncubator: "Office furniture work at 600 NCL Innovation Park"
(3 Jul 2013) Notice inviting tender- BioIncubator: "Development of area around 600 NCL Innovation Park"
(22 Apr 2013) TDB Seed Fund at Venture Center, Pune - Round 6 Now Open! (28 Jan 2013)NSTEDB Seed Fund at Venture Center, Pune - Round 2 Now Open! 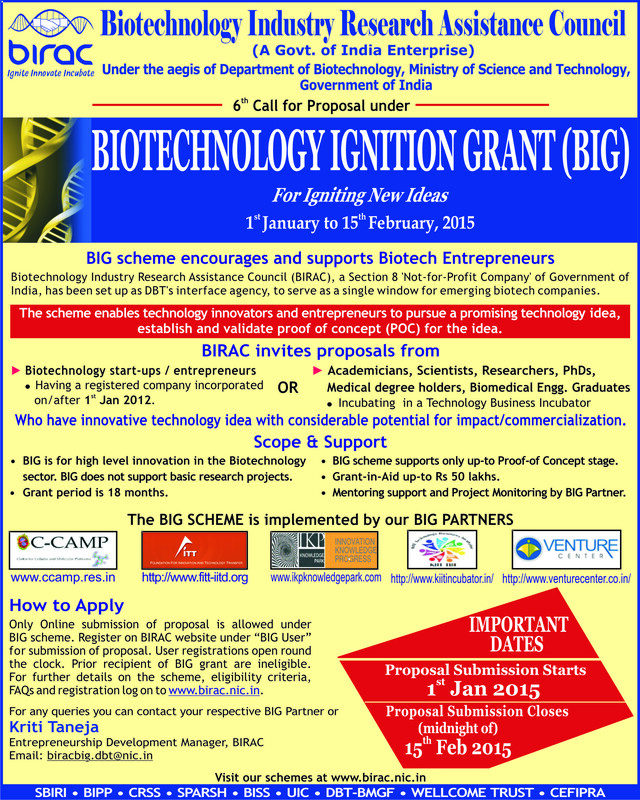 (Jan 01 2013,IE) BIRAC announces 2nd call for proposals under BIG. (Dec 18 2012)Venture Center's 2013 Desktop Calendar released. Available online. (Dec 3 2012,IE, TOI, DNA)Three Day Intensive Workshop on "Rheology of Paints & Emulsion"
(Oct 29 2012, IE, TOI)Workshop on "Business Valuation" & " Nuts and bolts of starting a new business"
(Sep 15 2012)TDB Seed Fund at Venture Center, Pune - Round 5 Now Open! 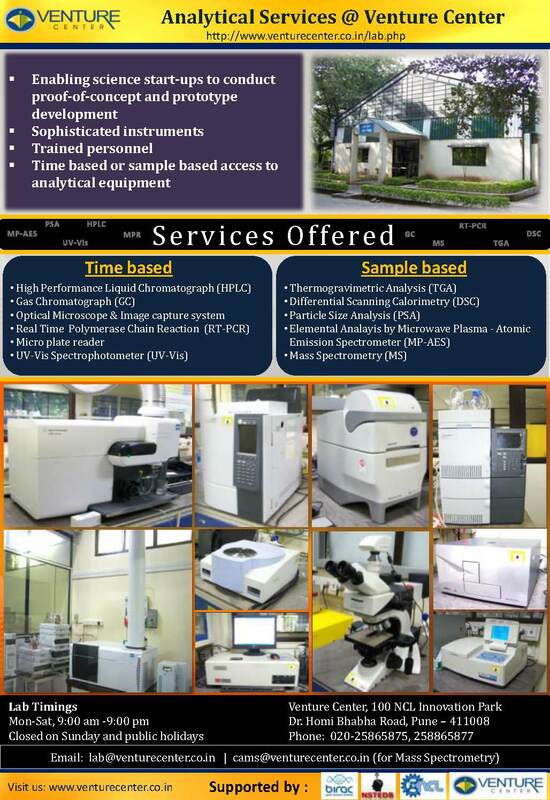 (Aug 17 2012, IE, TOI, Sakaal)5 day Workshop on "Animal Tissue Culture"
(Aug 2 2012, IE, TOI, Sakaal)Workshop on "Particle Size Analysis & Colloidal Stability Using DLS: Nano to Micro", "Thermal Analysis � DSC & TGA" and "Size Exclusion Chromatography"
(9 Jun 2012)NSTEDB Seed Fund at Venture Center, Pune - Round 1 Now Open! (10 Mar 2011) iTeams - 10K Business Plan Workshop announced. 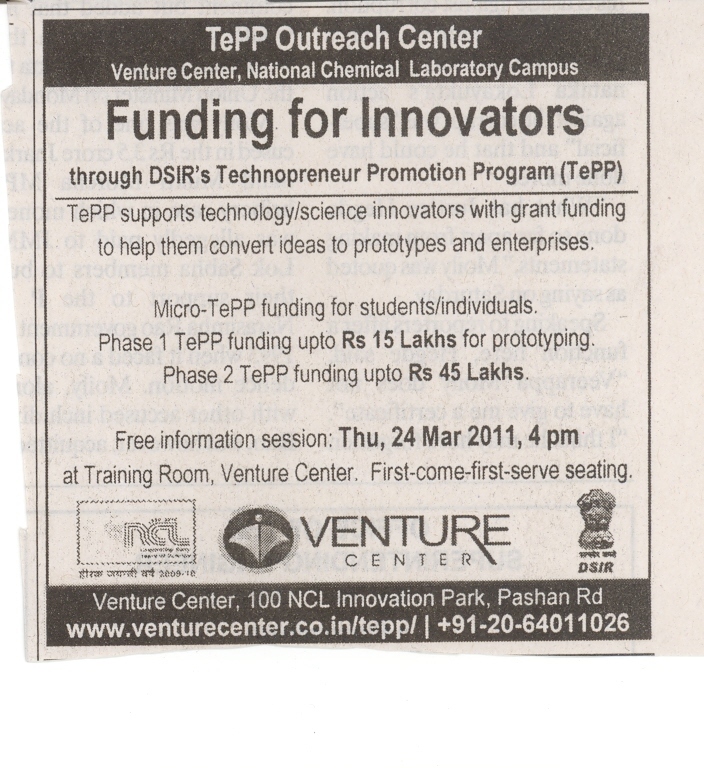 (03 Sep 2009) Venture Center launches "Funding Landscape in India for Technology Ventures"